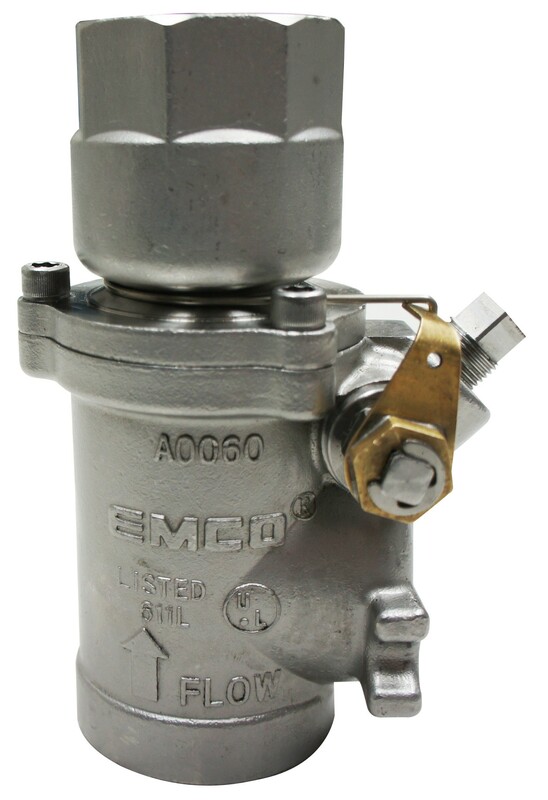 The Emco A0060-003 Female Single Poppet Emergency Shear Valve has 1.5 NPT connection; incorporates a replaceable shear section and heat sensitive fusible link assembly. The Emco A0060-023 Female Double Poppet Emergency Shear Valve has 1.5 NPT connection; incorporates a replaceable shear section and heat sensitive fusible link assembly. The Universal 521RFS-15 Female Single Poppet Safety Valve has 1.5" NPT with a single seal. This item comes standard with 2 inch female threads; provides ease of operation and reduced maintenance. The Universal 522DP-RF-15 Female Double Poppet Safety Valve has 1.5" NPT and two independent seals. This item comes standard with 2-inch external male bottom threads; provides maximum security. The Universal 522RFS-15 Female Single Poppet Safety Valve has 1.5" NPT with a single seal. This item comes standard with 2-inch female threads; provides ease of operation and reduced maintenance. The Universal 521DP-RF-15 Female Double Poppet Safety Valve has 1.5" NPT Threads and two independent seals for easy replacement. Provides maximum security. The OPW 10BF-5725 Female Single Poppet Emergency Shut-Off Valve has 1-1/2" NPT female threaded top (outlet) connection. It is installed on fuel supply lines beneath dispensers at grade-level to minimize hazards associated with collision or fire at the dispenser. The OPW 10BFP-5726 Female Double Poppet Emergency Shut-Off Valve has 1-1/2" NPT threaded top (outlet) connection. It is installed on fuel supply lines beneath dispensers at grade-level to minimize hazards associated with collision or fire at the dispenser. The OPW 10BHMP-5830 Male Double Poppet Emergency Shut-Off Valve has 1-1/2" NPT threaded top (outlet) connection. It is installed on fuel supply lines beneath dispensers at grade-level to minimize hazards associated with collision or fire at the dispenser. The OPW 10BM-5825 Male Single Poppet Emergency Shut-Off Valve has 1-1/2" NPT threaded top (outlet) connection. It is installed on fuel supply lines beneath dispensers at grade-level to minimize hazards associated with collision or fire at the dispenser. The OPW 10BU-5925 Union-Top Single Poppet Shut-Off Valve has 1-1/2" NPT union top (outlet) connection. It is installed on fuel supply lines beneath dispensers at grade-level to minimize hazards associated with collision or fire at the dispenser. The OPW 10BUP-5926 Union-Top Double Poppet Shut-Off Valve has 1-1/2" NPT union top (outlet) connection. It is installed on fuel supply lines beneath dispensers at grade-level to minimize hazards associated with collision or fire at the dispenser. OPW 10FTP-5701 is a 1 1/2" Female Double Replacement Valve Top for use with OPW 10BFP-5726 Double Emergency Shut-Off Valve. The OPW 10P-0150 10 Plus Single Poppet Emergency Shut-Off Valve has 1-1/2" NPT thread connection. The ONLY emergency shut-off valve in the world designed to protect your customers, investments, and the environment against the potential hazards of undetected shear groove leaks caused by low-impact incidents. The OPW 10P-0152 10 Plus Double Poppet Emergency Shut-Off Valve has 1-1/2" NPT thread connection. The ONLY emergency shut-off valve in the world designed to protect your customers, investments, and the environment against the potential hazards of undetected shear groove leaks caused by low-impact incidents. 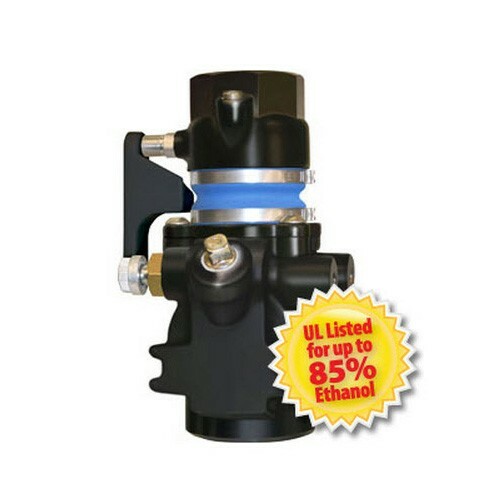 The OPW 10P-0150 10 Plus Double Poppet Emergency Shut-Off Valve has 1-1/2" NPT thread connection, is UL listed for up to 85% Ethanol. The OPW 10RF-2001 Female Single Poppet Emergency Shut-Off Valve has 2" NPT threaded top (outlet) connection. It is installed on fuel supply lines beneath dispensers at grade-level to minimize hazards associated with collision or fire at the dispenser. The OPW 10RFP-2002 Female Double Poppet Emergency Shut-Off Valve has 2" NPT threaded top (outlet) connection. It is installed on fuel supply lines beneath dispensers at grade-level to minimize hazards associated with collision or fire at the dispenser. OPW 10RFT-5742 is a 2" NPT Female Single Replacement Valve Top for use with 10RF-2001 Single Emergency Shut-Off Valves. The OPW 10RFT-5750 is a 1 1/2" NPT Female Single Replacement Valve Top for use with 10BF-5725 Single Emergency Shut-Off Valves. The OPW 10RFTP-5751 is a 1 1/2" NPT Female Double Replacement Valve Top for use with OPW 10 Series Emergency Shut-Off Valves. The OPW 10RFTP-5752 is a 2" NPT Female Double Poppet Replacement Valve Top for use with 10RFP-2002 Double Emergency Shut-Off Valves. The OPW 10RM-2003 Male Single Poppet Emergency Shut-Off Valve has 2" NPT threaded top (outlet) connection. It is installed on fuel supply lines beneath dispensers at grade-level to minimize hazards associated with collision or fire at the dispenser. The OPW 10RMP-2004 2" NPT Male Double Poppet Emergency Shut-Off Valve has 2" NPT threaded top (outlet) connection. It is installed on fuel supply lines beneath dispensers at grade-level to minimize hazards associated with collision or fire at the dispenser. The OPW 10RMT-5842 2" NPT Male Single Poppet Replacement Valve Top is for use with 10RM-2003 2" NPT Single Poppet Emergency Shut-Off Valve. The OPW 10RMT-5850 1 1/2" NPT Male Single Poppet Replacement Valve Top is for use with 10BM-5825 1 1/2" NPT Single Poppet Emergency Shut-Off Valve. The OPW 10RMTP-5851 1 1/2" NPT Male Double Poppet Replacement Valve Top is for use with 10BHMP-5830 1 1/2" NPT Double Poppet Emergency Shut-Off Valve. The OPW 10RMTP-5852 2" NPT Male Double Poppet Replacement Valve Top is for use with 10RMP-2004 2" NPT Double Poppet Emergency Shut-Off Valve. The OPW 10RU-2005 2“ NPT Union-Top Single Poppet Emergency Shut-Off Valve has 2" NPT union top (outlet) connection. It is installed on fuel supply lines beneath dispensers at grade-level to minimize hazards associated with collision or fire at the dispenser. The OPW 10RUP-2006 2“ NPT Union-Top Double Poppet Emergency Shut-Off Valve has 2" NPT union top (outlet) connection. It is installed on fuel supply lines beneath dispensers at grade-level to minimize hazards associated with collision or fire at the dispenser. The OPW 10RUTC-5962 2" NPT Complete Union Single Poppet Replacement Valve Top is for use with 10RU-2005 2" NPT Single Poppet Emergency Shut-Off Valve. The OPW 10RUTC-5975 1 1/2" NPT Complete Union Single Poppet Replacement Valve Top is for use with 10BU-5925 1 1/2" NPT Single Poppet Emergency Shut-Off Valve. The OPW 10RUTCP-5972 2" NPT Complete Union Double Poppet Replacement Valve Top is for use with 10RUP-2006 2" NPT Double Poppet Emergency Shut-Off Valve. The OPW 10SHMTP-5811 1 1/2" NPT Male Double Poppet Replacement Valve Top is for use with 10SBHMP-5830 1 1/2" NPT Double Poppet Emergency Shut-Off Valve. The Emco A0060-023S Stainless Steel Female Double Poppet Emergency Shear Valve has 1 1/2" NPT connection; incorporates a replaceable shear section and heat sensitive fusible link assembly. The Universal 521RMS-15 Male Single Poppet Safety Valve has 1.5" NPT with a single seal. This item comes standard with 2 inch male threads; provides ease of operation and reduced maintenance. The Universal 521RUS-15 Union Single Poppet Safety Valve has 1.5" Union Top with a single seal. This item provides ease of operation and reduced maintenance. The Franklin Fueling 662500901 is a union single poppet shear valve with 1 1/2" NPT connection. 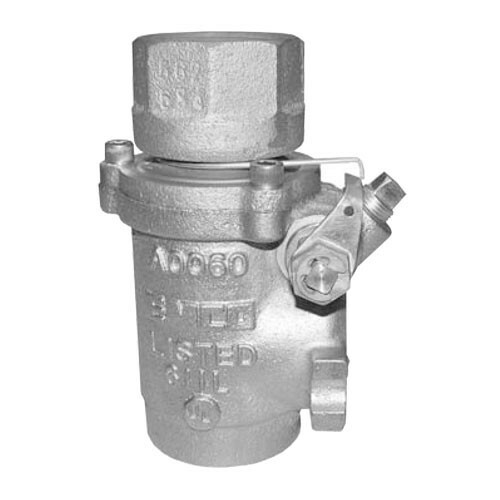 EBW ® product shear valves immediately stop product flow in the event of fire or collision at the dispenser. 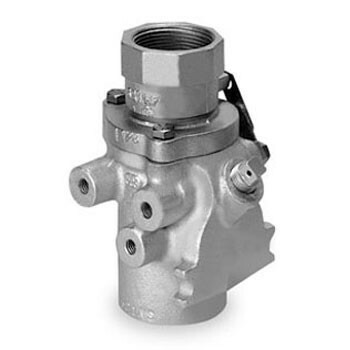 The Franklin Fueling 662500902 is a single poppet shear valve with 1 1/2" NPT connection. EBW ® product shear valves immediately stop product flow in the event of fire or collision at the dispenser. The Franklin Fueling 662500903 is a male single poppet shear valve with 1 1/2" NPT connection. EBW ® product shear valves immediately stop product flow in the event of fire or collision at the dispenser. The Franklin Fueling 662510902 is a female single poppet shear valve with 1 1/2" BSPT connection. EBW ® product shear valves immediately stop product flow in the event of fire or collision at the dispenser. The Franklin Fueling 662510903 is a male single poppet shear valve with 1 1/2" BSPT connection. EBW ® product shear valves immediately stop product flow in the event of fire or collision at the dispenser. 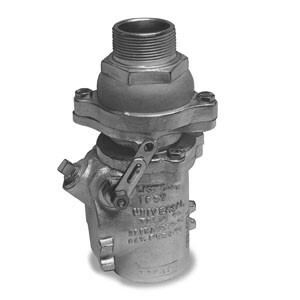 The Franklin Fueling 662501901 is a union double poppet shear valve with 1 1/2" NPT connection. EBW ® product shear valves immediately stop product flow in the event of fire or collision at the dispenser. The Franklin Fueling 662501902 is a female double poppet shear valve with 1 1/2" NPT connection. EBW ® product shear valves immediately stop product flow in the event of fire or collision at the dispenser. The Franklin Fueling 662501903 is a male double poppet shear valve with 1 1/2" NPT connection. EBW ® product shear valves immediately stop product flow in the event of fire or collision at the dispenser. The Franklin Fueling 662511902 is a female double poppet shear valve with 1 1/2" BSPT connection. EBW ® product shear valves immediately stop product flow in the event of fire or collision at the dispenser. The Franklin Fueling 662511903 is a male double poppet shear valve with 1 1/2" BSPT connection. EBW ® product shear valves immediately stop product flow in the event of fire or collision at the dispenser. 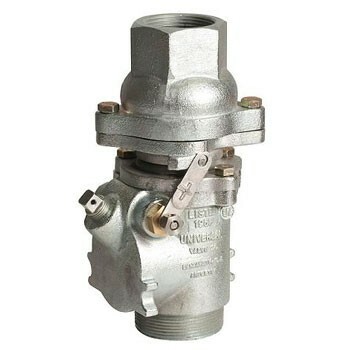 The Franklin Fueling 662502902 is a normally closed female double poppet shear valve with 1 1/2" NPT connection. EBW ® product shear valves immediately stop product flow in the event of fire or collision at the dispenser.